(CNSNews.com) - The federal government collected a record $1,521,589,000,000 in individual income taxes through the first eleven months of fiscal 2018 (October 2017 through August 2018), according to the Monthly Treasury Statement released today. 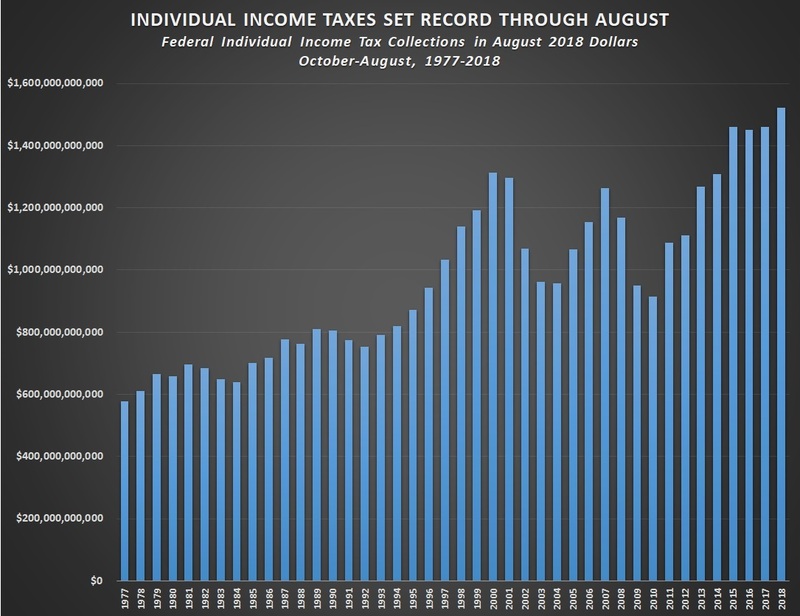 Prior to this year, the record federal individual income tax collections for the first eleven months of the fiscal year occurred last year, when the Treasury collected $1,460,379,260,000 in individual income taxes in constant August 2018 dollars (adjusted using the Bureau of Labor Statistics inflation calculator). Yet even while the federal government was hauling in a record amount in income taxes from individuals, corporation income tax collections and total federal tax collections were declining. 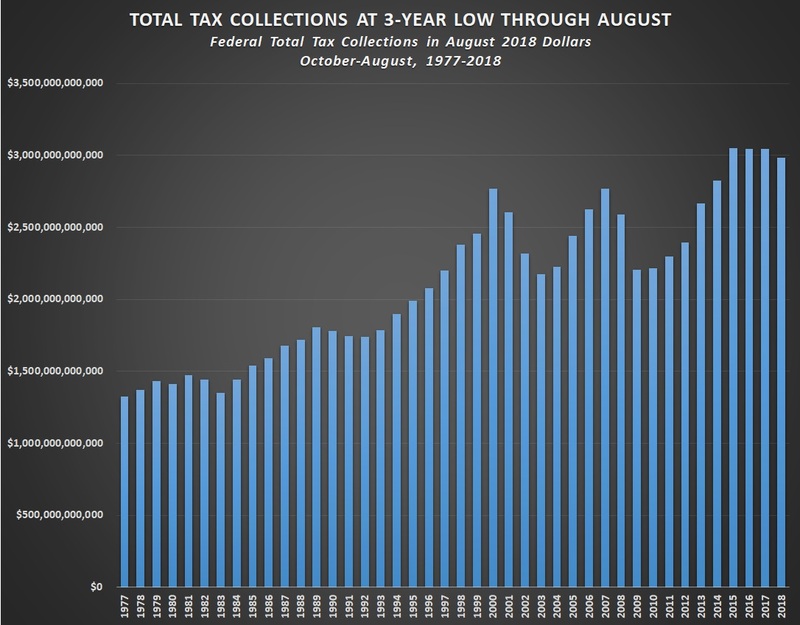 Real total federal tax collections dropped for the third straight year in the October-August period. In the first eleven months of fiscal 2015, the Treasury hauled in $3,050,571,320,000 in total federal taxes (in constant August 2018 dollars). In the same period in fiscal 2016, it hauled in $3,046,651,360,000 in total federal taxes (in constant August 2018 dollars); in fiscal 2017, it hauled in $3,046,234,320,000 (in constant August 2018 dollars); and in the first eleven months of this fiscal year it hauled in $2,985,186,000,000 in total federal taxes. 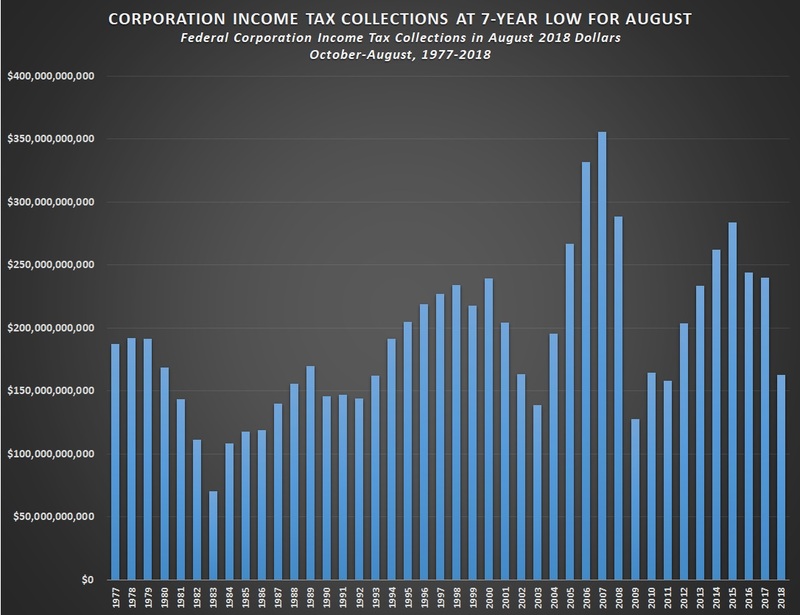 Corporation income tax collections in the October-August period hit a seven-year low in 2018. In fiscal 2011, they were $158,245,000,000 (in constant August 2018 dollars). Then, in fiscal 2012, they climbed to $203,871,620,000 (in constant August 2018 dollars). In fiscal 2013, they were $233,260,680,000; in fiscal 2014, they were $262,055,780,000; in fiscal 2015, they were $283,962,090,000; in fiscal 2016, they were $244,011,550,000; in fiscal 2017, they were $239,937,120,000; and this year, they dropped to $162,551,000,000. 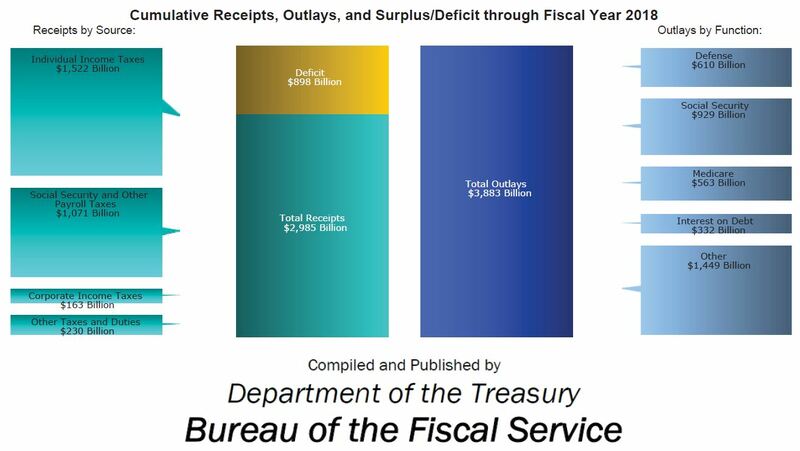 The federal government has run a deficit of $882,112,000,000 in the first eleven months of fiscal 2018 because while bringing in $2,985,186,000,000 in total taxes, it turned around and spent $3,883,298,000,000. In addition to the $1,521,589,000,000 in individual income taxes and $162,551,000,000 in corporation income taxes that the federal government has collected in the first eleven months of this fiscal year, it has also collected $1,070,777,000,000 in Social Security and other payroll taxes; $78,909,000,000 in excise taxes; $20,693,000,000 in estate and gift taxes; $36,726,000,000 in customs duties; and $93,940,000,00 in miscellaneous receipts.